Today, we've released Alfred 3.5 which brings a new bookmarks feature, improvements to workflows and other features, as well as support for macOS 10.13 High Sierra, which is due to be released later today. If you're upgrading to High Sierra, we've published a post with a few tips to ensure you get the smoothest experience with Alfred. 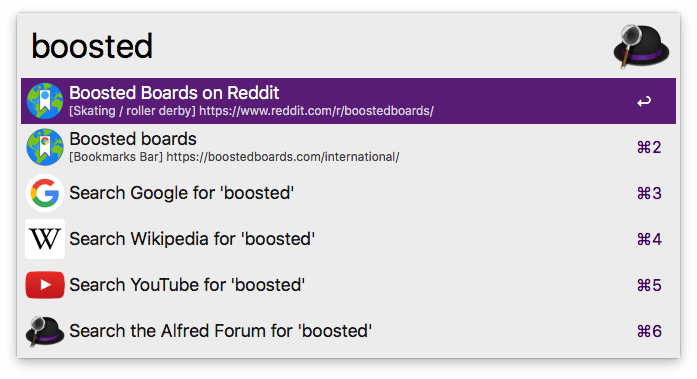 Alfred 3.5 adds a new Bookmarks feature, where Alfred indexes and searches for your bookmarks, removing the dependence on the macOS metadata. You can include results from both Safari and Google Chrome to your results, and can choose to either include bookmarks in your default results (more convenient) or prefix them with a keyword (lower results noise). It's also up to you whether the bookmarks are opened in the bookmark's source browser, or always in your default browser. If you previously included bookmarks in your default results, you'll need to re-enable them under Features > Bookmarks. You may have noticed in the first screenshot above that the Fallback Searches are shown even though Alfred has found local results. This improvement, available to Powerpack users, works particularly well if you include bookmarks in your default results, as you may want to search the web for your keyword even if you have a bookmark with the same keyword. You can set this at the bottom of the Features > Default Results preferences. We've also made significant improvements to workflows, mostly based around script filters, so take a look at the Change Log for more details as well as the full list of additions to this latest release.